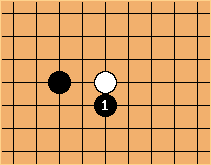 In this local position, the keima - tsuke combination of is often seen. In particular, when the initial stones are on the third or fourth line, the play is quite frequent and it may be worthwhile to look at the implications. It must be pointed out that the initial stones are rarely alone. Sebastian: Charles, you said in Monochrome shapes in black-and-white that you don't like the keima attachment page title. What else would you call this move? Charles I would call it a supported attachment. If there were a more specific name, I'd have no hesitation in renaming this page. Sebastian: Well, maybe it helps to keep in mind that many of these two word combinations, such as grapefruit or dragonfly, have only a very loose resemblance to the first word.